E-mail comments or questions to feedback@soundstagehifi.com. I don’t know if you remember the test of the Simaudio Moon Evolution 740P preamp some years ago. Here in Norway, there is some problem with hi-fi shops -- I can’t seem to hear this preamp and the loudspeakers I want together. My preferred loudspeakers are Sonus Faber Olympica IIIs, and I would love to hear from someone who has tried this preamp, and maybe hear if you believe that Simaudio and Sonus Faber will be a good match. My preferred sound is open and airy treble with a good middle tone and a firm bass. And I love Pink Floyd music together with the Eagles and even Pet Shop Boys, and even Metallica and Motörhead. So, if you could spare me some minutes answering this e-mail, I would be grateful. I am happy to. I not only remember the review, I still have that same 740P in my system, so I know it well. I don’t know if you’re aware that I also reviewed the Sonus Faber Olympica III speakers a few years ago. Loved your review of the EMM Labs DA2 Reference DAC. You demonstrate such a high degree of process methodology. It sounds like EMM was “testing” you by sending you the DA2 without explaining the changes. I purchased the EMM XDS1 in 2011 after hearing it at RMAF with several other top SACD players. I had the unit upgraded to the V2 version in 2015. It’s been the centerpiece of my audio system ever since. I do listen to digital downloads stored on a PC server connected to the XDS1, but I still prefer SACDs, partially because I prefer physical media I can collect, but I also believe I hear a sound improvement over FLAC files. You appear to have a good working relationship with EMM -- I wonder if you know if these DA2 software changes are applicable to the XDS1 V2? I’d very much appreciate any information you can provide. I take it you like [the U-Turn Audio Orbit Plus] turntable? I am interested myself, but am not a vinyl junkie. Siltech 330L Speaker Cables Still Recommended? I just read your review of the Siltech 330-series cables and as I’m looking to upgrade my speaker cables and may have a deal on a pair of 330Ls, I thought you might be the ideal person to ask! I’m listening to my 40-year-old Dahlquist DQ-10s, rebuilt by Regnar about ten years ago, driven by my Bryston 4B3 amp and Ayre KX-5 Twenty preamp. I’m currently using Nordost Red Dawn 2 cables, while the Heimdall 2s have been a recommended upgrade, and so I’m wondering how the Siltech 330Ls might compare? 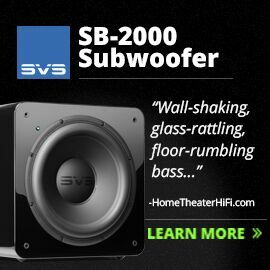 Thanks for penning such a nice, compact review of a pair of small and predictably competent $200 speakers from PSB. Before reading, there was no question in my mind that this review would be about pleasant overperformers that rolled off around 60Hz, with all that’s entailed in that. The question you hinted at that’s dying to be answered is whether it’s better to pair these little standmounts with a commensurate sub (~$399? ), or just buy a bigger pair of standmounts for $500-$600? In other words, does extending the bass of the Alpha P3 down to the 30s make a three-box solution a clear winner over a two-box solution for similar money? For your series of reviews of cheap-’n’-cheerful kit -- bravo, by the way -- having an inexpensive sub on hand would allow readers to make an even more informed purchase decision. An interesting layer to these reviews would be to test your little system both on a bookshelf and nearfield on a desk, the latter of which is gaining in popularity for people who work at home or otherwise listen at their computers. NAD D 3045 or C 338? Both the NAD D 3045 and the NAD C 338 are very similar and are only $50 difference in price. The D 3045 is 10Wpc more powerful and has two-way Bluetooth with aptX. The C 338 has Bluetooth, Wi-Fi, and Chromecast Built-in. What do you think is the future of amplifiers with Chromecast Built-in now that Google has discontinued Chromecast Audio? I’ve been thinking of getting the C 338, but now I’m more inclined to purchase the D 3045. As far as I know, Google isn’t abandoning their Chromecast technology -- they only abandoned the Chromecast Audio streaming device, which originally sold for $35, but they blew out for $15-$20 a few weeks ago and have now officially discontinued. It’s unfortunate. With the addition of the optional TosLink cable, the Chromecast Audio dongle was a godsend for streaming bit-perfect digital audio at resolutions up to 24-bit/96kHz to any component with a TosLink input. It was also an inexpensive way to set up multiroom audio in a home. In fact, it’s in use in my system that forms the “System One” column on this site. Shortly after the announcement, I went shopping to buy additional Chromecast Audio streamers, but they seem to be sold out everywhere. Google now only sells the Chromecast and Chromecast Ultra devices, which, with their HDMI connectors, are meant mainly for video streaming. An A/V Receiver or a Preamplifier and Power Amplifier for KEF Blade Twos? I have a question about what equipment [I need] to power a pair of KEF Blade Twos. Would I really be able to hear a difference if I powered the Blade Twos using a class-D3 receiver (e.g., Pioneer SC-LX901), compared to if I used a preamp and amplifier (components)? In other words, spending about $2000 on a receiver versus spending $20,000 on a preamp and amp setup? You can assume the music being played is modern rock/pop/R&B (e.g., Top 40), so I assume we’re dealing with stuff that’s been digitally compressed (low dynamic range). In other words, source material that isn’t musically demanding to playback on a speaker system. You can also assume it won’t be played at very high volumes (e.g., >100dB). Given the above listening conditions, would using a high-end receiver be more than enough to power the Blade Twos? I hate to brand an entire product category as poor performing, but to the get to the nuts and bolts of my answer quickly, that’s what I feel I have to do. So here goes -- while all-in-one receivers, such as the one you mentioned, are impressive in terms of how many features they have and the number of channels of amplification they pack into a single box, all the ones I’ve heard come up short on sound quality, as well as power output. I think that it simply comes from jamming too much stuff into that box -- everything gets compromised. For instance, let’s take a look the SC-LX901 you mentioned: On Pioneer’s website, they claim that its power output into a 6-ohm load is 200W, but they’re also honest enough to say that’s with only one channel being driven and the test is not even across the audioband -- it’s for a 1kHz test signal. You can be sure that if they used 20Hz to 20kHz as their bandwidth and drove two channels, the power output would be considerably lower. What’s more, they say that its distortion level is 0.9% for that 1kHz test, which is high for a modern solid-state amplifier. I wouldn’t assume that the music you play will mask any of those deficiencies -- rock, pop, and R&B can be pretty demanding, particularly in the bass. Those musical genres also tend to sound best played fairly loud. Given that the Blade Two has a nominal impedance of about 4 ohms, I suspect that this receiver will not only have trouble driving a pair of Blade Twos to any decent volume level, its distortion will be rather high as well, so you won’t be getting the clean sound that you can get from better-quality amplification. A couple of years back I bought the KEF Reference 1s blindly based upon your review, and I sure have been pleased with the speakers, but I am eager to try a full-range speaker. I am considering the Reference 3 or the GoldenEar Technology Triton Reference. What I am wanting is a clean, fully transparent sound, with a fantastic soundstage. My room is only 200 square feet, and the speakers will be powered with an Anthem STR Integrated Amplifier. Do you have a recommendation? That’s an outstanding integrated amplifier you have that will work well with either speaker, particularly since it has Anthem Room Correction (ARC) built in, which helps mate any speakers to any room. The thing is, I can’t tell you which speaker to buy exactly, but I can give you some guidance since I have reviewed both. I am sure that if you love your Reference 1s, you’ll love a pair of Reference 3s just as much. Within a series, but even from series to series, KEF’s speakers sound similar. What you normally get as you go up in price from one model to the next is deeper bass, as well as slightly higher sensitivity and output capability. With your small room, the increased sensitivity and output capability won’t matter much, but the deeper bass that the Reference 3s deliver will definitely flesh out the bottom end. Insofar as soundstaging goes, I suspect the Reference 3s will perform similarly to the Reference 1s, but with the deeper bass they can give, you might find that gives you a sense of larger soundstage spaces and a more enveloping overall sound. GoldenEar Technology’s Triton Reference is an outstanding loudspeaker that, at about $9000/pair, is something of a bargain as far as full-range speakers go. Right now, I’m actually reviewing the new Triton One.R, which, at about $6000/pair, might be an even greater bargain, so you could also consider that model, particularly since your room isn’t that big. Can You Direct Connect a USB Drive to the NAD D 3045? I have over 2TB of high-res FLAC and MQA files on a USB drive that won’t fit on my PC anymore. I prefer a minimal stereo system (no separate DAC, amp, preamp, network player, NAS, PC, etc.) and wondered if the versatile NAD D 3045 with speakers is the solution I am looking for. Can the NAD D 3045’s USB input read my portable drive’s music files, with a mobile app as a remote? I prefer not to power up so many components (esp. a PC) just to hear a song. I hear you on wanting to keep components to a minimum. Unfortunately, the USB Type-A port on the NAD D 3045’s backside won’t allow you to hook a portable hard drive to it and play music. Instead, that connector is labeled Service and is used to apply firmware updates to the D 3045. As a result, you’re going to need some sort of computer-type device (e.g., a desktop or laptop computer, or a standalone music server) that the drive can attach to and can decode the files and deliver them to the D 3045, probably via the USB Type-B connector that’s there for that purpose, or through one of the other digital connectors. The D 3045 can do a lot, but not everything. Vivid Audio or Rockport Technologies or Magico? Luxman or Pass Labs for Revel Salon2 Speakers? Loudspeakers: Tried-and-True Revel Salon2 or Unknown Verity Audio Amadis S? A Subwoofer for the Muraudio SP1s? Did the Buchardt S400s Show? Revel's Salon2 -- Still One of the Best After All These Years? MQA: The Emperor's New Clothes? Audio Research's GSPre -- Why the Tubes? Hegel H360 vs. Devialet 120 or 200? KEF Reference 201/2 -- Still Recommended? Is MQA Going to Go the Way of HDCD? Off the Deep End to the KEF Blade Two? When is the Hegel H360 Review? Decisions, Decisions . . . Triton Ones or Mythos ST-Ls? PSB T3 or Focal No2? The Imagine T3 Too Mellow? PSB Imagine T2 or KEF R Series? "All this is crap compared to the Omniwave"
Is the Simaudio Moon Evolution 740P Worthy of Reviewers' Choice? 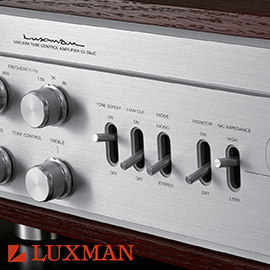 Luxman 700u-Series Differences -- More than Price? Revel or JL Audio Subwoofer? 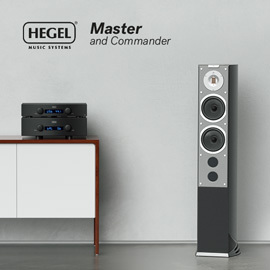 Hegel with KEF or Revel? Are the Sonus Faber Olympica IIIs All That and More? Simaudio 740P or EMM Labs PRE2? Torn! Simaudio or Hegel Music Systems? From B&W 802 Diamonds to Vivid Audio Giya G2s? Where Are the Revel Performa3 Reviews? Are You Recommending CD Players Anymore? Integrated Amplifiers: Audio Research, Unison Research, or Other? Paradigm Inspiration Grilles -- On or Off? PSB or Paradigm or Sonus Faber or GoldenEar? Which DAC: NAD M51 or Bryston BDA-2? KEF R500s or LS50s Plus Sub? Simaudio Moon Evolution 700i or 600i? Bruce Springsteen’s "Tunnel of Love" Remastered? Vivid Audio's Oval Series -- Great Too? Is the EMM Labs PRE2-SE Any Good? Giya G2s -- "In a word, fantastic." DACs: dCS, Esoteric, or . . . ? PMC, Salk, JMR or . . . ? Revel F208 in the Works? Is It Best to Biwire? Simaudio Moon or Audio Research? Classé Audio CP-800 Coming Soon? Wilson Alexandria XLF Measurements "Quite Poor"
DACs: Calyx or Meitner Over PS Audio? Arcam Amp for KEF R500s? Streaming -- Right or Wrong? The DP1 and the LS1 -- Anything to Gain? A "real" PSB T2 review! Are USB-equipped turntables good for digitizing vinyl? Dual Devialet D-Premiers and the Magico Q7? Bel Canto or Audio Research? "The BEST approach to show coverage that I have seen." ". . . the Bryston BDP-1 was exceptional." ". . . a harbinger of future preamps." Aerial Acoustics 7T to Rockport Technologies Mira 2 to . . . ? Musical Fidelity, Simaudio Moon, or Channel Islands DAC? Vivid B1 with Devialet or Spectral? "Thank you for sharing . . ."
Upgrade to Dynaudio or Paradigm? Is Doug wrong about the demise of SACD? "Problems you forgot to mention"
Decco and Touch: coaxial or optical? Is the Devialet D-Premier in the same league? Belles, Audio Research, or Cary? "Assessing Bass Performance" -- essential and extraordinarily helpful! Roksan amps with the PSB Synchrony One speakers? 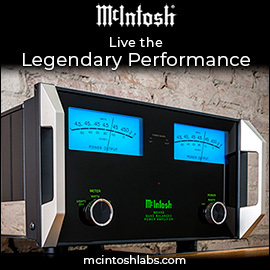 CD players: Classé, McIntosh, Krell, Esoteric, EMM Labs, or . . . ? Any Coda Technologies reviews coming? Will Musical Fidelity drive his Monitor Audio speakers? Paradigm, PSB, B&W or Thiel? B&W 803 Diamond or Aerial Acoustics Model 9? 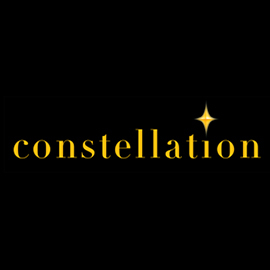 I'd like to see a review of . . .
Belles 350A better than a pair of 150As? Is the One the one? DefTech Mythos a big upgrade? Moon 600i cool or warm? An opinion on the Luxman DU-80 player? NAD still the amp to buy?